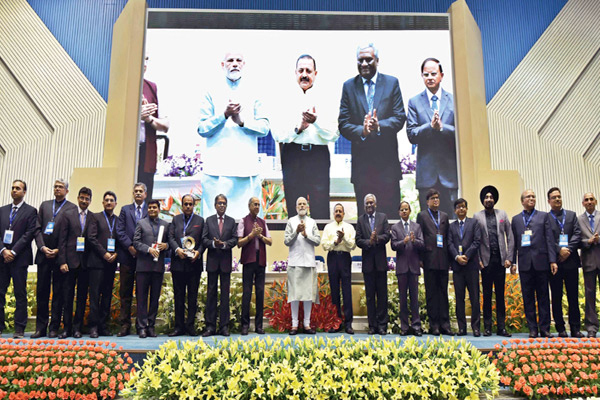 There was a big change in the 12th annual Civil Services Day, organised to deliberate administrative issues and give away awards to performing civil servants—the proceedings and speeches this time were in Hindi. Also, NSA Ajit Doval was missing from action this year. IT is said in Hindu mythology that one gets moksha (Salvation) after char-dham yatra (visit to four pilgrims comprises Badrinath, Dwarka, Puri and Rameswaram), but in the government, even after 32 such journeys a file does not get moksha—Narendra Modi was sharing his experience after ruling for four years as Prime Minister of India. Modi shared his experience of an apparent reference to administrative delays in the decision-making process. 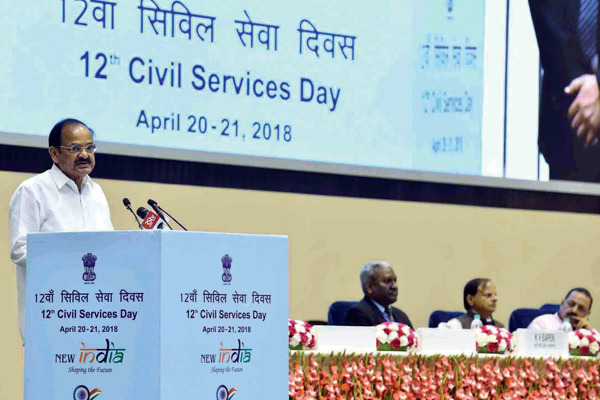 The Prime Minister was addressing civil servants on the occasion of 12th Civil Services Day on April 21, 2018. 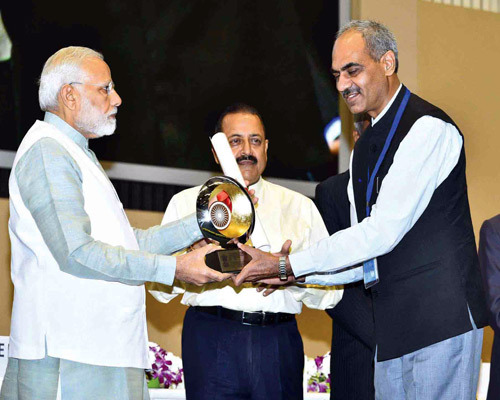 The two-day annual Civil Services Day was organised to deliberate administrative issues and give away awards to performing civil servants. 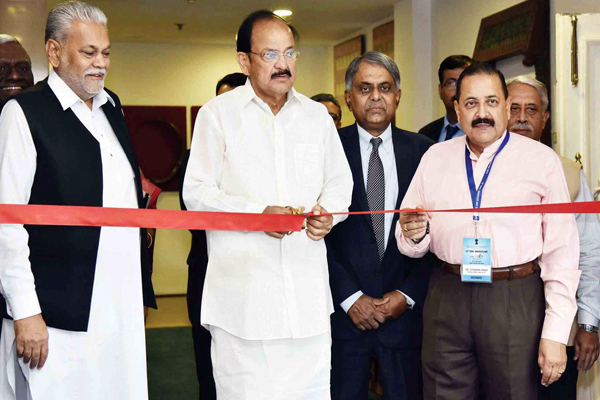 The first day of the function was inaugurated by Vice-President M Venkaiah Naidu. Naidu was very candid in his approach and cautioned civil servants that “business as usual” approach will not do. It is a shift from doing a ‘job’ to ‘serving the people’. The job has a higher objective, a different yardstick for success. It should have ‘people’ at the centre and it should be done with a “spirit of service”. There was a major shift this time in the function. The proceedings were conducted in Hindi. 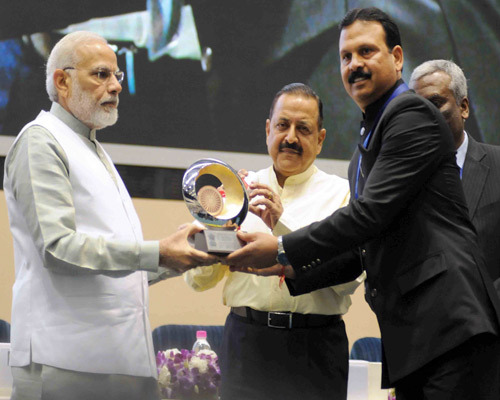 DoPT Minister Dr Jitender Singh, who spoke in English in the inaugural function of Civil Services Day, delivered his lecture in Hindi in the presence of the Prime Minister. Even Cabinet Secretary PK Sinha spoke in Hindi. 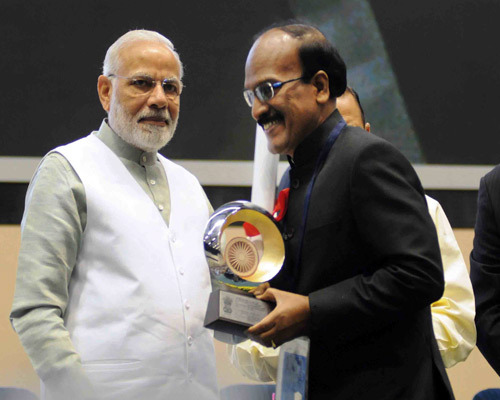 Principal Secretary Nripendra Misra and Additional Principal Secretary Dr PK Mishra were active during the awards function but the smiling face of National Security Advisor Ajit Doval was missing. 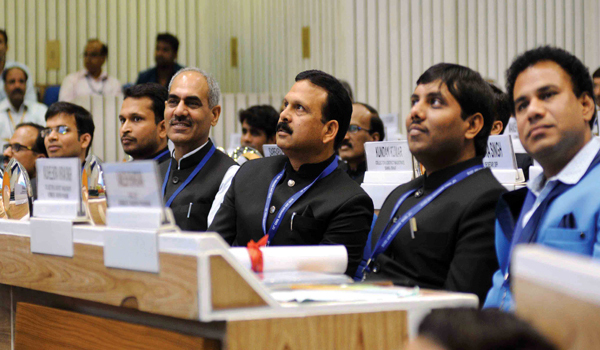 NITI Aayog CEO Amitab Kant, while chairing the plenary session, said that central and all State governments, along with Prabhari (incharge) officers, are involved for transforming aspirational districts. In other breakaway sessions, Parshottam Rupala, Minister of State for Agriculture & Farmers Welfare and Panchayati Raj, chaired the Session on Pradhan Mantri Fasal Bima Yojana; Hardeep Singh Puri, Minister of State (Independent Change), Housing & Urban Affairs, chaired the session on Pradhan Mantri Awas Yojana; and, Aruna Sundararajan, Secretary Telecom, presided over the session on Promoting Digital Payments. KV Eapen, Secretary Department of Administrative Reforms and Public Grievances (DARPG), moderated the wrap-up of four breakaway sessions. Chairing the wrap-up session, Cabinet Secretary PK.Sinha brought out five points common to all the breakaway sessions. He said generating awareness, innovative approach, use of technology in implementing government’s schemes, convergence of various government programmes and need for a strong database for implementing the programmes are some of the important focus areas in achieving the targets. 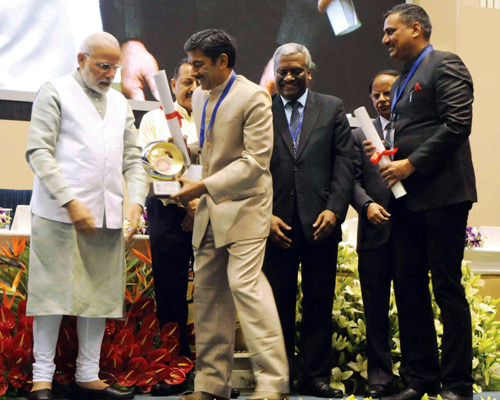 Prime Minister’s Awards for Excellence in Public Administration are presented to Districts/Implementing Units for implementation of priority programmes and innovation categories. With participation from a large number of districts across the country in the awards scheme, the scale of entire process was very large. 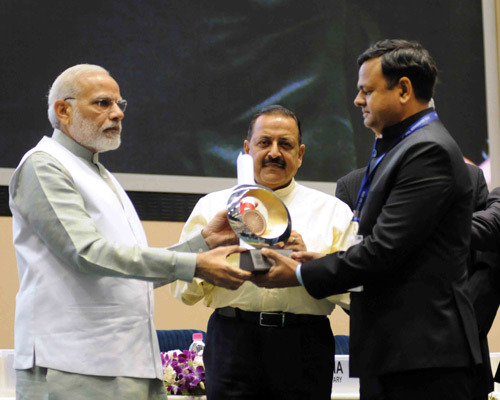 The award function focussed on the priority programmes of the Prime Minister. Modi made a monotonous activity live and competitive. 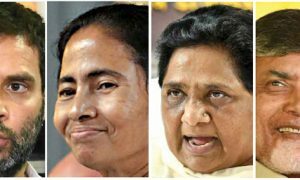 The programme also coined a new word “Aspirational Districts” for backward districts. 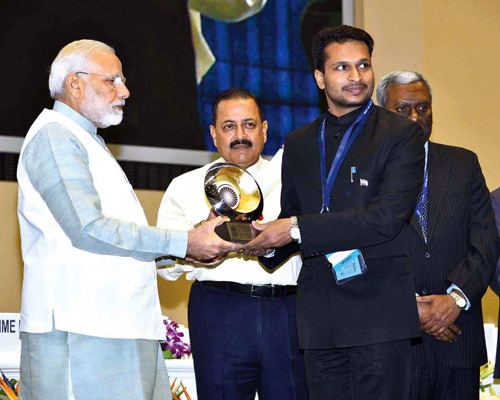 Modi was candid when he said we have to search those districts that have not participated in this gigantic task. I am not in favour of punishment for non-participation, but I am eager to know their problems, Modi said. Speaking on the subject of Aspirational Districts, the Prime Minister said that these 115 districts could become growth engines for their entire States. 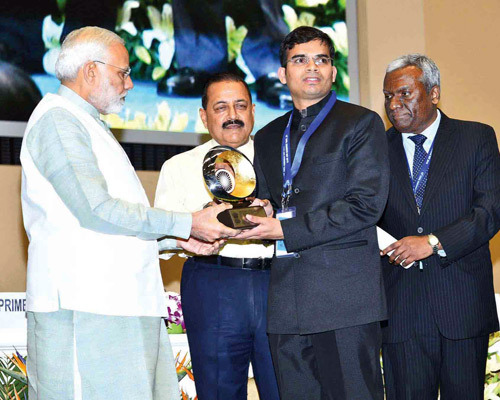 He stressed on the importance of Jan Bhagidaari, or public participation, in development. 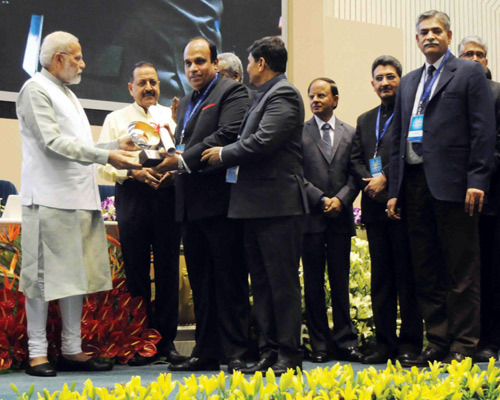 Modi asserted that all available technology, including space technology, should be used for improving governance. He said it is important for civil servants to keep pace with emerging technologies worldwide. 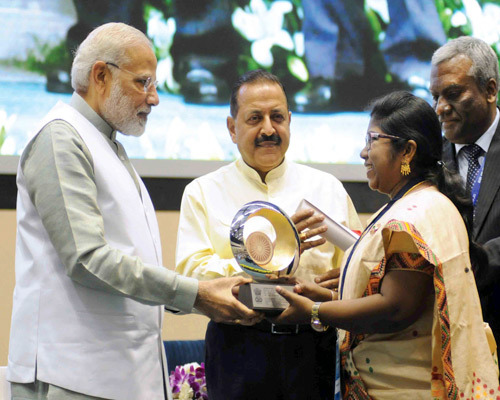 A total of 643 Districts participated in the PM’s Awards Programme. Total of 3,009 applications with 2010 applications from Districts/Implementing Units under the Priority Programmes category and 999 applications from Organizations of Central/State Government/Districts including Aspirational Districts were received under Innovation category. End-to-end process was conducted on the platform, darpg.wooqer.com. Idea conceptualization and platform was made ready within a day. A unique user-id was created for all the users of the platform, i.e. 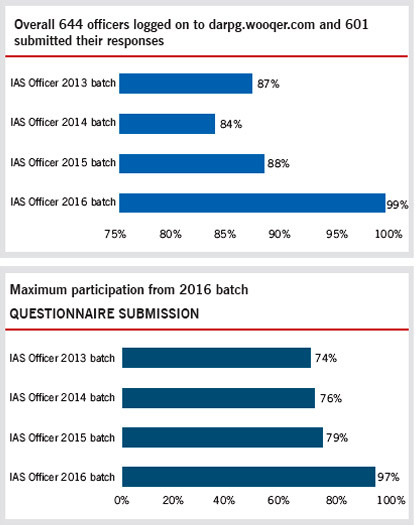 688 IAS officers of batches 2013 to 2016 & for the producers/ managers of the overall process, i.e. DARPG officers for real time monitoring/tracking. These user-ids along with passwords were shared with the individual officers on their email-ids & mobile numbers. As many as 53 case studies/best practices across the selected Priority Programmes & Innovation were made available on the platform for all the 688 IAS officers of 2013 to 2016 batches, to impart learning to them. A comprehensive questionnaire was uploaded to gauge their understanding of these programmes and to seek their suggestions/feedback for the improvement in the implementation of these programmes for efficient public delivery. Enthusiastic participation has been observed in this activity, wherein 644 officers (out of 688) logged-on to this platform to go through the content and 601 of them submitted their response on the Questionnaire. Completion of this end-to-end activity in 27 days, demonstrates the efficacy of technology tools in better and effective two-way communication amongst various stakeholders within an organisation, irrespective of their different geographical locations. 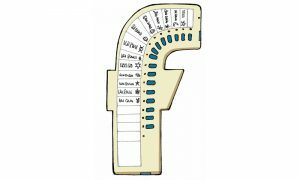 Usage of such tools in a structured and formalised manner, saves a lot of time, energy and resources for an organisation. 109 publicity campaigns and farmers’ awareness programmes have been conducted in 2016-17, and 140 have been conducted in 2017-18 at the District, Block, Sector, and Gram Panchayat levels. Publicity has been done through social and electronic media and m-Kisan State Portal. Regular co-ordination and review meetings with all stakeholders were conducted along with intensive awareness campaigns by District Administration to incentivise newly insured farmers. Village Level Entrepreneurs (VLEs) operated at Common Service Centres (CSCs) for the increased participation of farmers. SHGs, Farmer’s Club spread awareness about the Programme. Both Village Level Workers (VLW) and Insurance Company representatives were present during the processing of applications and assessment of crop damage. 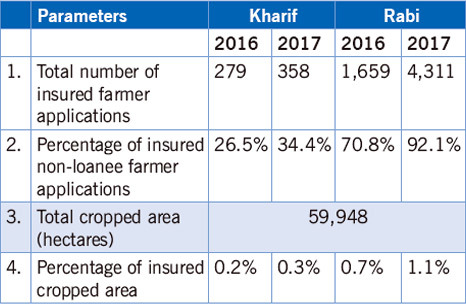 Information regarding insured farmers was uploaded timely on Crop Insurance Portal by various financial institutions. Geo-tagging and photo uploading during Crop Cutting Experiments (CCE) were also done. Under electronic submission of CCE, 63.2% of the target has been achieved for Kharif 2016 and 61.4% for Rabi 2016. Additionally, electronic transfer of compensation directly into bank accounts of farmers took place. Dissemination of complete and proper information to farmers in vernacular language is one of the most important aspects for the success of the program. District administration conducted special Gram Sabhas in all 1031 Gram Panchayats to educate the people about PMFBY. 2,949 Common Service Centres (CSC) were established providing technical assistance to Village Level Entrepreneurs (VLE). District level call centre, print media and electronic media was used such as All India Radio, local cable channels, published bulletins and posters. Training was provided to RDD & Revenue Staff at Village Level and VLE for filling of crop insurance form through CSC centers. Senior officers like Divisional Commissioner and Agriculture Commissioner were involved in District level discussion groups. Banks were opened on Sundays and public holidays for farmers to submit applications and Krishi Mitras participated by assisting in filling application forms. Farmers’ producing organizations, ideal farmers in the District, Gat Sheti farmers, etc. assisted in the process. NGOs like Global Parli, Manavlokand Chief Minister Rural Development Fellows in villages also got involved in the programme implementation. Applications were uploaded online via an online portal (http://agri-insurance.gov.in/login.aspx). CCE results were submitted through mobile app (CCE Agri) and compulsory usage of geo-tagged photo took place. The scheme used compete Aadhaar authentication via usage of Aadhaar number (de-duplication, etc.) and linkage to Jan Dhan Account. It also leveraged other schemes like Nanaji Deshmukh Krishi Sanjivani Yojana, Gat Sheti Yojana, Magel Tyala Shet Tale and Magel Tyala Vihir. 100% claims were settled of Kharif and Rabi 2016 within time (Rs. 232.84 crores and Rs. 4.05 crores, respectively). District was 1st in the state to get maximum number of applications in Kharif 2016, 2017 and Rabi 2016, 2017. The focus areas, with regards to implementation of DDUGKY, are listed below. Awareness was created through the circulation of leaflets, banners, and conducting meetings in the village and Gram Panchayat. A youth database survey through Community Resource Persons (CRPs) was also conducted. Eligible school dropout youths are identified and registered by DDU-GKY officials from different villages and Panchayats so as to prepare them for sending them to training centers. The CBOs and their sub committees are given orientation about the Yojana and accordingly they discuss it in their meetings so as to get good output from the Scheme. DDUGKY stall was highlighted during NAMAMI Brahmaputra and Dhemaji Haat. Organizations such as CBOs/SHG/VO/CLF were strengthened and were provided access to the training centres and encouraged to interact with the trainees. Regular meetings were conducted in the PlAs at Block and District level. There was convergence with MGNREGA to create awareness about the DDUGKY scheme. 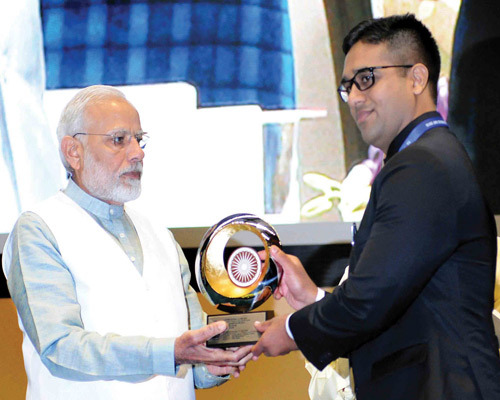 Use of technology was promoted at multiple levels by promotion of Kaushal Panjee for online registration of candidates, and the use of smart phones to relay information relating to the scheme. To ensure transparency, SHG and VO members were given access to the training centres to meet candidates from their region and interact with them. In addition, the candidates were counseled by District and Block level officials through visits to the training centres. Before mobilization, regular meetings were conducted with PIAs and strategies were adopted to reduce the number of dropouts. The community was made aware about the reasons of dropouts and the possible ways to combat them, and the parents are counselled for the same. Out of the allocated District target of 1875 for training, 153 candidates completed training. Further, 120 candidates are placed for 3 or more months. The number of candidates in SECC households in the District with at least one deprivation is 1, 55,978 and a total of 272 candidates were mobilised. Awareness was created through campaigns at Panchayat level and wide publicity through various media mediums. Visits to junior colleges were made where the young unemployed were briefed about the programme and resource persons interacted with the youth. At every level of the process, community organizations like SHGs and Village Organizations (VOs) were involved at every level of the process, specifically in motivation and awareness generation, identification of skill gaps, identification of target skills, and registration of students. NGOs, public representatives, and alumni of the programme were also involved in motivation of candidates. The use of the technology for this programme involved SMS alerts, interaction with employers through video call facility, and counselling with job role based videos. Call centre support for registration, counselling, and grievances redressal was also established, and success stories of candidates were shared on the website of the programme. To maintain transparency, candidates were selected through screening camps at the village level. All training and placement details were provided on the programmer website. Progress reports of candidates/trainees were prepared which were shared with the parents, supplemented with monthly parent meetings at the training centres. District Rural Development Authority staff carried out home visits for mobilization, counselling of dropped out youth and acquired feedback from stakeholders. The courses offered in the training programmes were recognized by the National Council for Vocational Training (NCVT), Sector Skill Council (SSC), or Ministry of Rural Development (MoRD), with a minimum duration of 90 days with 75% assured placements, with mandatory coverage of 50% SC/ST, 15% minorities, 33% women and 3% people with disabilities. 2,209 candidates were trained in the programme, exceeding the allocated target of 1201.2072 candidates were placed into jobs for 3 months or more. The total number of candidates in SECC households in the District with at least one deprivation were 4, 78,473, out of which the programme reached to 1%. A total of 3767 candidates were mobilized in the District. In most cases, the placements are only three months or less which does not really make a difference. Focus should be in generating quality skills rather than just numbers. The industry and businesses must be made a part of the skills training programme. Contributing funds and taking in youth trained under this scheme must be made part of CSR of companies. Identification of the type of skills required in the local market or nearest urban location is a must to ensure that correct and needed skills are imparted to the beneficiaries. Attention to this program needs to be increased at all levels. Program should be monitored and implemented by single dept for better results. Also, in aspirational districts VTP presence is poor. It should also be monitored directly from state and central govt. leadership. Accreditation of training institutes, linking industry / service firms with the training institutes and designing customised training modules, including on-site training in the program can be crucial. PRADHAN Mantri Awas Yojana – Gramin (PMAY-G) is a social welfare flagship programme of Government of India with a vision to provide pucca houses, with basic amenities, to all homeless householders and those living in kutcha and dilapidated houses by 2022. To ensure that assistance is targeted at those who are genuinely deprived, PMAY-G select beneficiaries using housing deprivation parameters in the Socio Economic and Caste Census (SECC) 2011, which is to be verified by the Gram Sabhas. Using this information, Permanent Wait List is generated to ensure that the States have a ready list of the households to be covered under the scheme leading to better planning of implementation. The implementation and monitoring of programme; carried out through an end to end e-governance model using AwaassSoft and Awaas App. The focus areas, with regards to implementation of (PMAY-G), are listed below. 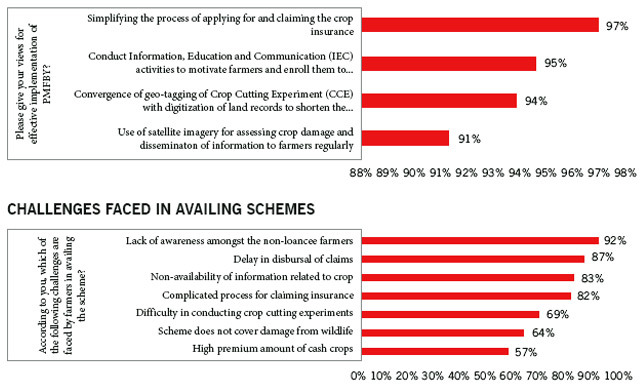 Inefficiencies in verification of beneficiaries seen as the biggest challenge. Conducting sessions for creating earthquake resistant structures for the seismically sensitive Kangra District. Officials and non-officials associated with the construction were trained and equipped with the guidelines of the scheme, construction technologies and MIS part of the scheme. Briefing of these stakeholders was done from time to time. Masons were provided training of construction techniques at Government Polytechnic Sunder Nagar along with technical staff of Blocks. The Awaas app was downloaded on the mobiles of those Officials who were assigned the houses for construction and monitoring. The existing technological options were used i.e. mobiles with officials and technical expertise of field level functionaries and trained masons. Design and typology were the crucial requirements, which were incorporated by engaging local masons and using local designs and earthquake proof structures. Houses were constructed as per the need of the beneficiary, cost effectiveness and maximum use of local materials. The basic requirement of the scheme i.e. 25 sq. mt. area along with kitchen and sanitary latrine was ensured in the construction of all houses. Due to spillover effect of urban areas, people in rural areas were opting for brick masonry and slab houses owing to the durability and ease of construction of such houses. constructed in convergence mode under MGNREGA. So far, out of 1068 sanctioned houses against the target, 711 houses have been completed. Several initiatives were undertaken for creating awareness such as celebration of the completion of houses on Awas Diwas, programmes conducted on digital banking, Government insurance schemes and Mukhya Mantri Swarozgar Yojana. Multiple hygiene and sanitation drives were conducted in the form of construction of twin-pit toilets, community level meetings to sustain use of household toilets and benefits of Open Defection Free (ODF) environment. In addition, 3M Facilitation Model (Man, Mason, Material) was adopted by the District. Further, a PM Parivar card was issued by creating a family profile (based on standard of living, social indicators and economic indicators) and updating details on the portal. Capacity building of officers was undertaken at different levels on construction, monitoring, etc. The District provided 45 days training, comprising of both theory and practical, held at Block level to train masons as ‘Rajmistris’. For this purpose, 105 unskilled labourers, 35 from each block, were selected and trained as ‘Rajmistris’. A total of 732 people were transformed from unskilled labourers into certified skilled ‘Rajmistris’ during 2016-18. Model houses were constructed during training programmes. The officers were trained to use technology mediums (such as geo-tagging and software handling). Use of only locally produced construction materials (such as Singoli stone for slab construction and Suvakheda stone for flooring, bricks and cement, etc.) were promoted. 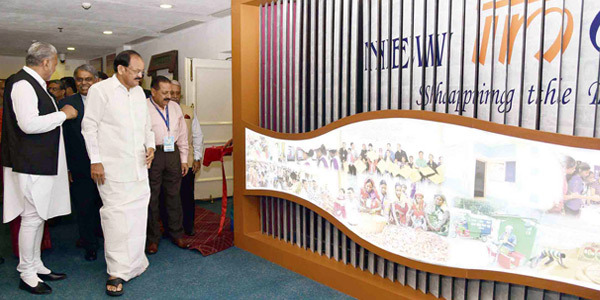 Convergence was done with other schemes by way of gas connections provided through Ujjwala Yojana, electricity connections through Saubhagya Yojana and toilets constructed through Swachh Bharat Mission (SBM). Additionally, 12 brick enterprises were set up under Mukya Mantri Swarozgar Yojana which have supplied construction materials.46 centering enterprises were set up under Mukya Mantri Swarozgar Yojana which have provided services in construction of houses under PMAY (Gramin). 150 Self Help Groups (SHGs), whose members are beneficiaries of the scheme were provided with bank linkages. So far, out of 5026 sanctioned houses against the target, 3931 houses have been completed. The financial assistance should be increased for hilly areas because of high transportation cost of building material in those areas which are not connected with roads. Water harvesting provision should be made mandatory and budget for the same should be provided. CBRI or other technical agencies should conduct workshops for beneficiaries on effective low cost building technologies. Automated process flow and self-verification of stage wise building for fund release is the way forward. This eliminates corruption and delay created deliberately at the lower level. Construction cost is high. Poor are hesitant due to fear of falling into debt trap. No funds to start construction. The focus areas, with regards to implementation of PMAY – Urban, are listed below. Converging with other schemes such as Swachh Bharat Mission, AM RUT, NULM and Smart Cities etc. Government of the Union Territory, with a vision to extend the benefits of the PMAY scheme to all the section of society had given wide publicity about the scheme through print and digital media. Applications were invited from public to ascertain the housing demand. The applications received were segregated based on the documentary proof submitted in respect of the ownership of land. The validation was undertaken by spot verification, including exclusion of duplicate beneficiaries. The list of the applicants who were found to be the eligible for selection under the Beneficiary Led Construction (BLC) vertical of PMAY were published for social scrutiny by displaying prominently in different offices and respective implementation agency offices. In addition the list was also uploaded in the Government web site for information. Public was informed through newspaper advertisements and was given a limited time period for submission of their views / objections / comments with regard to the list of beneficiaries. The submissions received from public were duly addressed and the final list was placed for selection to the State level monitoring and selection committee of PMAY for facilitating the financial sanction. The Puducherry Government, by converging the state level housing scheme of Perunthalivar Kamarajar Centenary Housing Scheme (PKCHS) extended Rs. 2 lakhs to each beneficiary of BLC- PMAY. Out of this, Rs. 1.5 lakhs was provided by Central Government for the PMAY scheme and Rs. 50,000 was given from the financial sanction made under the State Housing Scheme. In addition, there was convergence with other schemes like Swachh Bharat Mission IHHL and Smart Cities Mission was also done. As part of the pre-construction strategy adopted to meet housing demand, several steps were undertaken such as area specific demand assessment, consultations with stakeholders, identifying free land for development of houses, preparation of layout, obtaining approvals, preparation of cost estimations and finally ensuring budget provisions. The Government of Telangana brought in a novel concept and a flagship programme to enable 2BHK vertical development houses with inbuilt maintenance mechanism and social and physical infrastructure provision on par with the private sector. This was termed as the ‘Dignity Housing’ model. Under this model, 3 types of houses were planned to be constructed, i.e. G+3 (In situ); S+5 (In situ and Vacant) and C+S+9 (Vacant). Counselling and awareness were activities undertaken by Urban Community Wing (UCW) of GHMC and SRACO NGO. Adoption of Shear wall technology which enabled a production cycle of only 1-3 days because of higher precision and smoother finishes in production of walls and slab units. Precast concrete building construction model was also used which allowed reduction of in site labor and form work and in turn, increased the speed of construction with improved durability. Additionally, MIS was used for capturing online data of beneficiaries, details of funds released and geo-tagging of projects. Convergence with other Departments to reacquire unutilized land holding including coordination by Chief Secretary to Government and active coordination with District Collectors. Further, Jawaharlal Nehru Architecture and Fine Arts University (JNAFAU) was involved for the designs of 2BHK housing model. In addition, fly ash bricks and PPC cement was used in compliance with regulations by Ministry of Environment, Government of India. The total demand received was 1, 19,255. Further, the number of validated demand is 1,07,267. Out of this, the total number of houses sanctioned between 01.04.2016 —31.12.2017 are 94,108. At present construction is being approved without taking into consideration of the future basic infrastructure needs such as Sewage, Drinking Water and Roads in most of the tier 2 cities. It might lead to development of concrete slums in future. Construction cost- labour and material is very high in urban areas. Ready houses may be given for a lease of 100 years to each family instead of land parcels. Focus on in-situ construction of houses in slum areas so as to avoid the issues of transit shelter and loss of livelihood for many people. Government of India’s own Housing Corporations dedicated only for affordable housing is the need of the hour to cater to states with poor Institutional Capacity in implementing housing programmes. Land is an issue in hilly State of Himachal Pradesh. 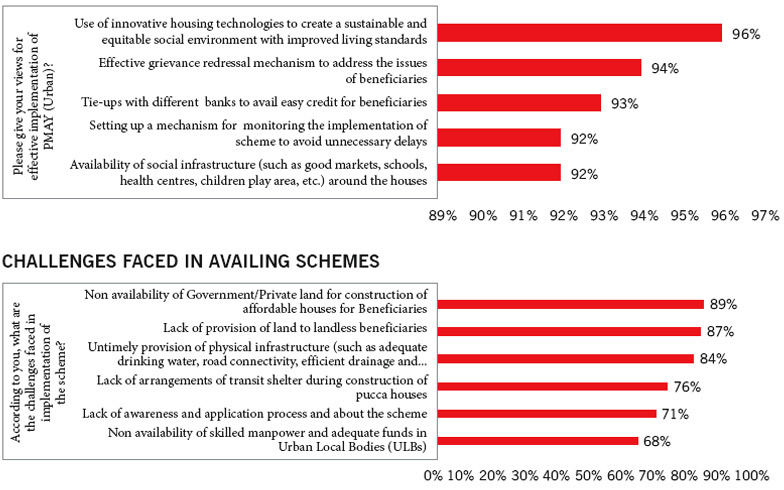 Most land is forest land which requires cumbersome diversion procedure under FCA and delays low cost housing projects. 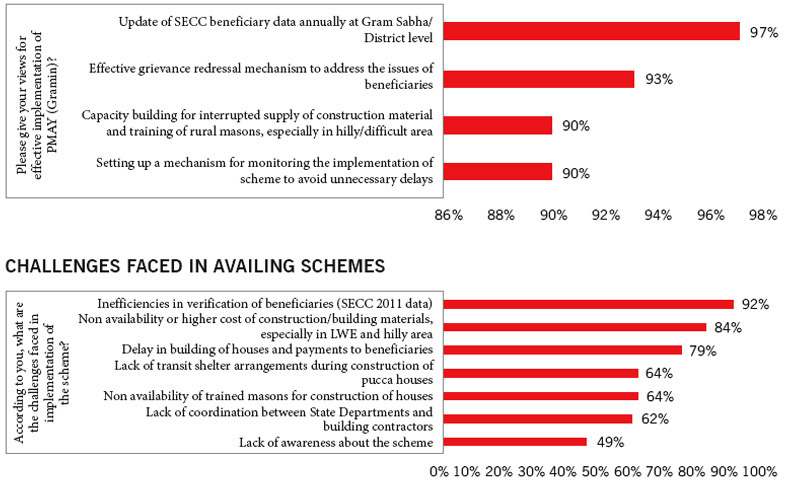 Non availability of undisputed land in cities, undocumented property rights for many homes and therefore lack of eligibility, outdated SECC data. THE Digital India programme is a flagship programme of Government of India with a vision to transform India into a digitally empowered society and a digital economy. 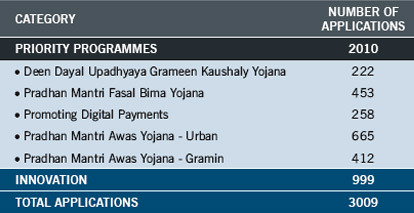 Enabling Public Financialmanagement System (PFMS) facility in the Panchayats of the Districts. Adopting digital payment facilities at ration shops and fertilizer sho[s to enabled digital payments. PDP The Digital India programme is a flagship programme of the Government of India with a vision to transform India into a digitally empowered society and knowledge economy. 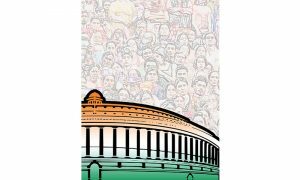 “Faceless, Paperless, Cashless” is one of the professed roles of Digital India. Promotion of digital payments has been accorded highest priority by the Government of India to bring each and every segment of the country under the formal fold of digital payment services. The vision is to provide facility of seamless digital payment to all citizens of India in a convenient, easy, affordable, quick and secured manner. Government is working on strengthening of digital payment infrastructure and creating awareness through promotions of digital payments with all the stakeholders to achieve Government’s vision of making citizens of this country digitally empowered. Citizens have been provided multiple options to make digital transactions. A dedicated ‘Digi Dhan Mission’ has been set up in MeitY for building strategies and approaches in collaboration with all stakeholders to promote digital payments and create awareness. With the aim to create awareness about Digital Payments mission, local people were involved along with different civil societies regularly. Further, door-to-door campaign were organised for financial literacy and to educate people about the digital payments. Workshops were conducted along with competitions in schools and colleges. Karang Island was a remote and backward region which was relatively cut-off from the District due to insurgency issue for a long time. In this regard, incentives were provided for training towards digital payments and 5 POS machines were provided on the island. Self Help Groups (SHGs) and youth clubs were involved for community mobilization and parallel activities were conducted on the island for Aadhaar enrolment and bank account opening. Additionally, shop-to-shop awareness was also provided coupled with set up of POS machines for fertilizer dealers. Campaigns were launched in market areas among merchants and consumers to promote digital payments. An ‘I Pledge’ campaign was launched to contribute to the Government’s vision of creating a cashless, and corruption free India by spreading information about digital financial transactions. Incentive scheme were provided to promote BHIM (i.e. ‘Install BHIM and get INR/- 50’). Free POS machines were provided for merchants and fertilizer dealers who open current account. Digital Bishnupur – An online channel was launched to make people literate about digital payments and create awareness among the citizens. In addition, social media interventions were made for promoting digital payments. Karang Island of the District became first cashless island of the country. Cash outflow per capita from SBI Bishnupur branch reduced by 33% and Bishnupur district got the 2nd position in painting and slogan writing at state “Digi-DhanMela” 2017. All 24 Gram Panchayats, 6 Municipal Councils are enabled with Public Financial Management System (PFMS) facility. 92% of Bank accounts were seeded with Mobile and 70% of Bank accounts were seeded with Aadhaar. Further, percentage of electricity bills paid through digital payment mode increased from 78% to 97% in the last 20 months. Digital payments awareness was created by following ‘Train the Trainers’ model in the District. Around 1000 people from various sectors and groups were provided extensive training. Promotions were done for the programme by leveraging banners, hoardings, mass SMS and social media platforms. A special meeting was organized for more than 700 industrialists where they were imparted training on various modes of cashless payments and urged to ensure that their employees and workers also switch to cashless modes of payments. Further, 140 teams were formed to undertake door-to-door campaigns (to ensure that at least 1 person from each household does a digital transaction). A mega Cashless Daman campaign was launched where the District Administration officials addressed 3000 people on digital payments. It was made mandatory for industries to make payment only through bank accounts. Digital payments videos involving students, teachers, small vendors were made and circulated over WhatsApp, Facebook and Twitter. In all 11 Panchayats, funds were disbursed through Public Financial Management System (PFMS) only and cashless fund collection facilities were available at Citizen Services Centres. POS machines and other digital payment facilities were provided in all 38 Fair Price Shops. All 10,000 fishermen purchased diesel through cashless methods only. All industries moved to 100% cashless payment of salaries to workers. All distilleries, petrol pumps, restaurants and hotels have digital payment facilities. Further, Cashless Citizens Services (i.e. G2C, B2C services) were provided at 37 Common Service Centres (CSCs). Government to Government payments were 100% digital and a Government payment to beneficiaries was 100% via Direct Benefit Transfer (DBT) only. All Government receipts above Rs. 1000 were accepted through digital payment only. 92% of Bank accounts were seeded with Mobile and 83% of Bank accounts were seeded with Aadhaar. The percentage of electricity bills paid through digital payment mode increased from 21% to 46% in the last 20 months. Identification of stakeholders and establishments was done to identify areas with maximum footfalls. 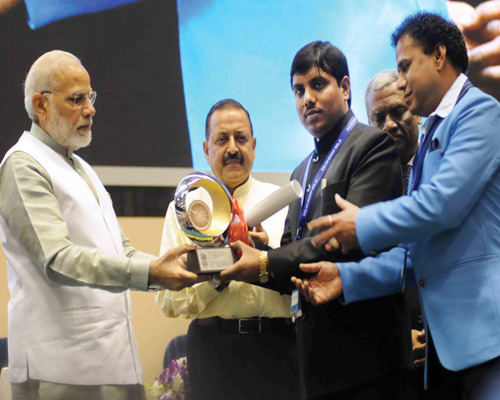 Digi Dhan Mela was conducted where 170 stalls were set up and footfall was around 1,50,000 and 112 awards were given. To augment the digital infrastructure, identification of gap between availability & requirement of Digi infrastructure was done. 1100 medium size banners were put up 1, 00,000 handbills were circulated. Additionally, banners were pasted on auto-rickshaws in all towns of the District. All Government schools spread the benefits of cashless payment to students during morning prayers. Further, private schools were instructed to give homework about digital payment methods which had to be completed by students with the help of their parents. ‘No Cash Hours’ was introduced at Government to Citizen touch points in the District. 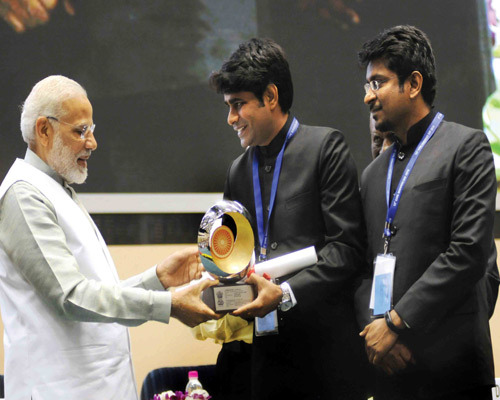 More than 1,90,000 digital transactions were facilitated by Saksham Yuva groups. 1558 key employees were trained initially who, in turn, trained 8000 employees of various departments. Training camps of traders, petrol pump owners, general public were held at Tehsil and subdivision level. In addition, training was provided to rickshaw drivers and vegetable vendors. Social media platforms (such as Facebook and Twitter) were leveraged for promoting digital payments. Bulk SMS campaign was created to generate awareness about digital payments. Video messages were broadcasted on cable TV channels and social media platforms. Sonipat has implemented 100% cashless enabled Subji Mandi. It also has the state’s first 100% cashless e-disha Kendra. Out of a total of 366 Fair Price Ration Shops (FPS), 350 are cashless enabled. Additionally, all 4 sub divisions, 6 Tehsils, 5 Municipal Offices are cashless enabled. Number of POS machine increased from 273 (Nov 2016) to 658 (Nov 2017). Further, 81% of Bank accounts were seeded with Mobile and 82% of Bank accounts were seeded with Aadhaar. Percentage of Electricity Bill through digital payment mode has increased from 4% to 88% in the last 20 months. We need to ask banks to forego transaction charges for digital payment of C2G services so that all Government offices can shift to cashless payment modes. This is required since many C2G services involve collection of taxes, cess and fees where it is not possible to pay transaction charges to banks. Younger generation who are not utilising their devices and knowledge of technology for beneficial purposes. The internet penetration and mobile banking should be promoted and also secure payment gateways will ensure confidence in the digital payments. The ever-increasing cybercrimes have cast a lot of apprehensions in use of Digital Payments. further the excess surcharge also acts to demotivate users to indulge into digital transactions. People in rural areas need to be given confidence about the security of digital transactions. On many large transactions, fees or charges are levied when made online which makes people to go for cash withdrawals. This needs to be countered to make more transactions digital. 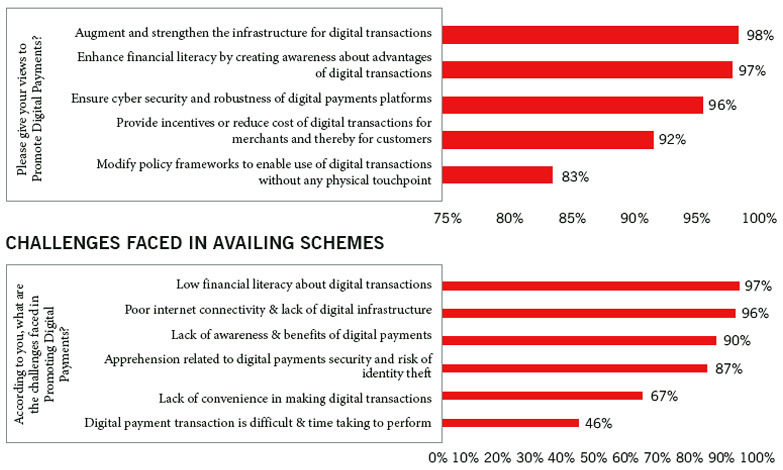 Low literacy about financial digital transactions is the major challenge. Case studies have been selected for an aspirational district who has contributed to the projects of electrifications, forest preservation, education for children, cleanliness programmes etc. Unnayan Banka is a multi-platform model in which students are getting modern day animated, contextualized and comprehensive videos on various technological platforms like LCD/LED TVs, projectors, laptops and mobile phones. Focused Content: 5-10 minutes of concept videos and contextualized content in the local language. Complete Learning Cycle: online assessments, digital report cards generation, round the clock doubt solving and real-time discussion groups by students from the remotest part of the District with expert teams scattered throughout India and abroad comprising of IIT graduates, corporate professionals and educators. Preparations for Competitive Exams: by integrating P0, SSC, IITJEE, and UPSC Civil Services on the mobile platform and students benefit by using the course content as well as by appearing in the mock tests on the platform, and getting feedback of their performance and their relative ranking with the other students appearing for the same test on the platform. Unnayan Smart Class included interactive video lectures, class assessments, audio learning, etc. School on Wheels is an LCD mounted van that visits LWE affected remote areas and provides specially designed crash course for Board exams. Boot camp has been started which provides latest and in demand technological skills to students like mobile app development, web designing, artificial intelligence, big data analytics, etc. Special Employability Bridge Programme is in place to facilitate placements. Attendance has increased from 17%to 53% and average marks have increased from 26% to 77%. Number of high schools using LCD TVs for multimedia learning have been extended to 40 schools after the success of 5 pilot schools. “Mera Mobile-Mera Vidyalaya” is being used by more than 10,000 learners, educators/experts and parents across India. 17 students got placement in the IT giant Tata Consultancy Services (TCS) and most of them belong to the underprivileged category. Introduction of Goods and Services Tax on 1st of July 2017 has been a very significant step in the field of indirect tax reforms in India. Introduction of GST would also make Indian products competitive in the domestic and international markets. Studies show that this would have a positive impact on economic growth. GST has subsumed various indirect taxes thus the multiplicity of taxes is reduced. With GST, uniform rate of CGST/SGST/IGST is applicable across all states. GST prevents cascading of taxes as Input Tax Credit is available across goods and services at every stage of supply. Final price of goods is expected to be lower due to seamless flow of input tax credit between the manufacturer, retailer and supplier of services. A massive four-tier training programme has been conducted under the leadership of NACIN. This training project is aimed at imparting training on GST law and procedures to more than 60,000 officers of CBEC and Commercial Tax officers of State Governments. Officers of the office of CAG are also participating and getting trained in this training programme. More than 52000 officers (including around 20000 officers from States) have already been trained. Out of these 7000 officers have attended refresher training course also. It will boost export and manufacturing activity, generate more employment and thus increase GDP with gainful employment leading to substantive economic growth. More efficient neutralization of taxes especially for exports thereby making our products more competitive in the international market and give boost to Indian Exports. Improvement in the overall investment climate in the country which will naturally benefit the development in the states. Reduction in compliance costs – No multiple record keeping for a variety of taxes – so lesser investment of resources and manpower in maintaining records. World Bank, as part of their Doing Business study, ranks 190 countries across 10 parameters annually. These parameters are: Starting a Business, Dealing with Construction Permits, Getting Electricity, Registering Property, Protecting Minority Investors, Paying Taxes, Trading across Borders, Enforcing Contracts and Resolving Insolvency. In India, World Bank assesses two cities, Delhi and Mumbai across these 10 parameters to arrive at country ranking. EoDB initiative has been launched with an aim to create a conducive business environment by streamlining regulatory structures and create an investor-friendly business climate by cutting through red tape. An online portal was launched by DIPP with the aim to provide real time ranking and tracking of the States and UTs based on the implementation of the recommendations and details of the good practices to learn and replicate from the experience. Final ranking of State/UTs on implementation of the 340 points were released in November, 2016. In 2017, DIPP has identified 372 reforms across 12 broad parameters covering; Labour Enablers, Contract Enforcement, Registering Property, Inspection Enablers, Single Window System, Land Availability and Allotment, Construction Permit Enablers, Environment Registration Enablers, Obtaining Utility Permits, Paying Taxes, Access to Information and Transparency and certain Sector Specific Reforms. The officers have contributed in identifying the reforms, whether in Central Government Ministries or State Govern-ment and development of an Action Plan for proposed reforms. They have contributed through their vast experience in development of Business Reforms Action Plan for State Governments. They tirelessly worked towards implementation of difficult and time taking reforms by conducting review meetings, engaging in stakeholder consultation, preparation of reports on reforms implemented, publicising reforms for wider reach and field visits to ground truth claimed reforms. Their vision and uncompromising attitude has helped in ensuring that reforms which look otherwise impossible have been implemented in record time. 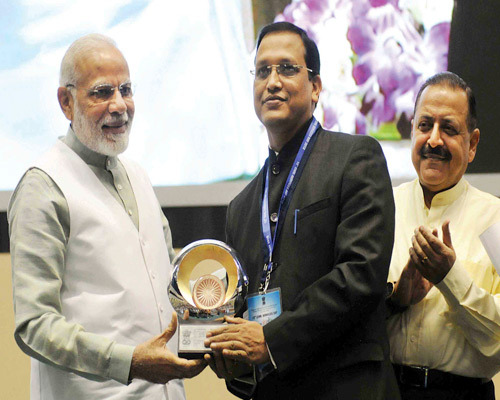 India marked its best performance on the independent assessment of business regulatory environment by the World Bank. World Bank has recognised efforts made in this exercise where India’s rank in Doing Business Rankings has gone up from 142 in 2014 to 100 in 2017. India has made a jump of 30 in ranking, the highest jump in ranks by any country in 2017. For the 1st time India broke the ceiling of top 100 economies and scaled 30 ranks within just 1 year. The CEO of World Bank visited India and congratulated Prime Minister and Indian Government for such rare feat in the programme organized on 4th November, 2017 at Pravasi Bhartiya Kendra, New Delhi. The States across country now quote their rank if they are in top 10 in DIPP’s state ranking. Every state is making efforts to outdo others. Information Education Communication (IEC) activities were undertaken for Swachh Bharat Mission (Gramin), which is an integral part of the behaviour change communication efforts made under the mission. The focus on changing sanitation behaviours is one of the key aspects of the Swachh Bharat Mission that set it apart from previous sanitation programmes. Shri Yugal Kishore Joshi focused on IEC (Information Education Communication) activities undertaken under the Swachh Bharat Mission (Gramin). Shri Joshi played a crucial role in the organization of several mass mobilization events such as ‘Swachh Shakti Celebration’, ‘Swachh Sankalp se Swachh Siddhi’, ‘Swachhata Hi Seva’ and ‘Swachh Shakti 2017’. 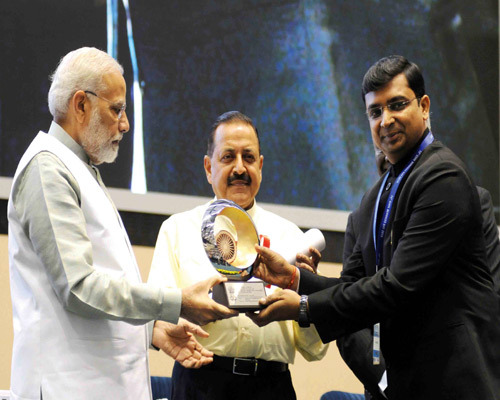 He planned high powered media campaigns like Darwaza Bandh and Shaucha Singh series that were broadcasted through electronic and print media to promote adoption of sustainable sanitation behaviour. For busting myths and age-old traditions related to open defecation, he planned special radio campaign around a central character, salesman Shaucha Singh who educates, informs and creates mass awareness for safe sanitation. He has spearheaded iconic national mega events and rolled out other national campaigns to mobilise support, toilets construction and accelerate momentum for the programmes. Shri Joshi has also contributed at the policy level by spearheading the drafting and issue of the IEC Guidelines of Swachh Bharat Mission (Gramin) and changes in policy for expenditure of these funds by State governments that made IEC spends much easier and smoother for States and districts. 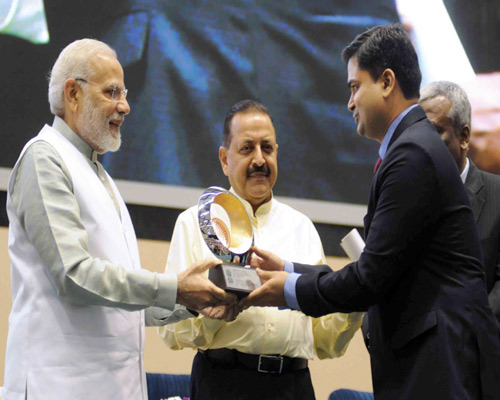 He was also instrumental in the design and implementation of the Swachh Bharat Mission (Gramin) mass media national campaign, Darwaza Band, in seven languages, which became a beacon for rallying forces of rural sanitation champions across the country. 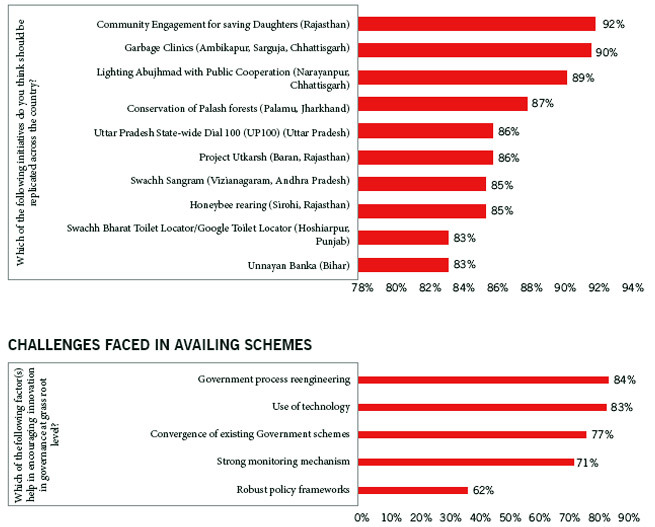 Behavioural change has noted among citizens towards sanitation, cleanliness and freedom from open defecation. 2.4 crores pledges, 2.9 crores paintings, 2.78 crores essays and about 4 lakhs short films received during one awareness campaign is a reflection of the impact generated among citizens. During ‘Swachhata Hi Seva’ campaign, a huge response was received where citizens, including armed forces and divyangs, across the length and breadth of the country volunteered for Shramdaan towards sanitation and cleanliness through various activities.